Matt and Courtney Larsen are a husband and wife real estate investing team specializing in wholesale property deals. Courtney is also a licensed Realtor with Keller Williams – Tampa Central. Together, their mission is to provide Real Estate Investors with deep discount properties that maximize cash flow and profits. 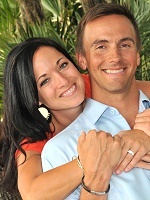 They are committed to helping others achieve success in real estate through their online program… “Mr.& Mrs. Quickflip.” Matt & Courtney are actively involved in Tampa REIA and are the founders and host of Beach REIA in Treasure Island, Florida and when they’re not working on the business, they are enjoying all that beach living has to offer!